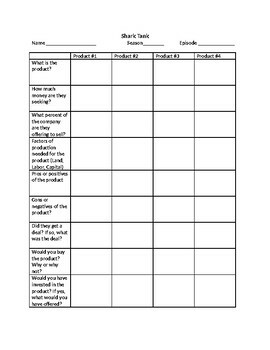 This graphic organizer gives students a guideline while watching the popular TV show Shark Tank. It encourages students to think critically about the products presented in the show while teaching them important Economic contributors. It covers things like factors of production, understanding equity, and much more. This would be great in any economics or marketing class. This can also be used in class, with the teacher showing episodes or for homework and have students watch episodes on their own.